Ideal for deep-rooted plants likes tomatoes and blueberry bushes, these 15" deep beds also create attractive focal points in the garden. Each bed includes four industrial-strength aluminum corners, 1" rot-resistant cedar lumber that's been pre-cut to the proper lengths, hardware and instructions. Easy assembly — just slip the boards into the corners and screw them in place. (12' long beds use two 6' boards with in-line connectors.) 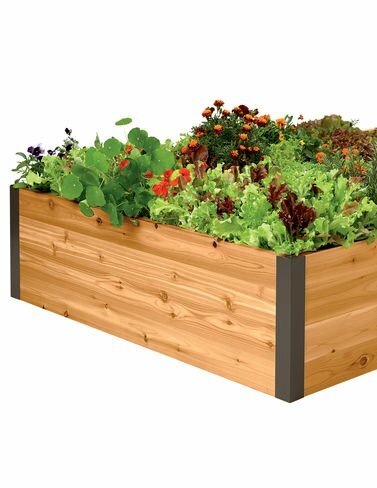 Raised beds are easy to set up, plant and maintain, producing high yields in a compact space with less digging and weeding. Use Deep Root Cedar Raised Beds to grow vegetables, or install the beds along a perimeter to create stunning border gardens. Made by us in Vermont.